Cables being strung on the Brooklyn Bridge, 1878. Photo courtesy of Wikimedia Commons. On May 24, 1883, the Brooklyn Bridge—after 14 years of construction—was opened at last. The mayor of Brooklyn, Seth Low, had declared the day a public holiday in his city; on the New York side, there was a “strong expression of sentiment” in favor of closing the Stock Exchange early. The president of the United States, Chester A. Arthur, along with future president Grover Cleveland, governor of New York, made a ceremonial crossing from New York to Brooklyn, which at the time were two separate cities that soon would become one. That night there would be a fireworks display of terrifying grandeur, 14 tons of explosives let off from the bridge itself, serpents of fire, flowers of fire, showers of fire. Then there were speeches, including two giving thanks to the Roeblings, the German family who had built it. First to be praised was John Roebling, a German immigrant who had conceived the bridge—but had died suddenly in 1869, before work had even begun. Then came a nod to his son, Washington, born in the United States, but who had grown up in a German-speaking community, not learning English until he was 11. Washington Roebling—in his foreign heritage, his ingenuity, and his longevity—defined as much as anyone what it meant to be American, at least in the 19th and early 20th centuries. Born in 1837, in western Pennsylvania when it still was the frontier, he died in 1926, in the Jazz Age. He was not only an engineer but also a scientist, a musician, a linguist, a husband and father. He served four long years in the Union Army during the Civil War, promoted from lowly private to colonel by the war’s end, and was known as Colonel Roebling to the end of his days. His name is mostly forgotten, but he made an American icon: a bridge that has served New York’s commuters and tourists and lovers for nearly 150 years while inspiring poets and painters and photographers from Hart Crane to Georgia O’Keefe to Walker Evans. Washington’s father John had been born in 1806 in Saxony; Johann August Roebling was his name until he emigrated to America in 1831. He trained in Berlin as a surveyor and an engineer, but Prussian bureaucracy stymied the ambition of this visionary and energetic man, and he resolved to make a new life for himself across the ocean. He would do all that and more. In 1842 he patented a design for making rope from wire, a development that made his, and his family’s, fortune. Wire rope would be the foundation of his great engineering works, not least his suspension bridge across Niagara Falls—strong enough to carry a locomotive—and the John A. Roebling Bridge across the Ohio River, which still connects Cincinnati and Covington, Kentucky today. John and his brother Carl were two of the 150,000 people who left what we now know as Germany between 1831 and 1840. They acquired land in western Pennsylvania; they and their fellow immigrants swiftly built a lovely little town, still intact today, which they called Saxonburg. It was here that Washington was born, and where he lived, in a wholly German-speaking community, until he went to school in the late 1840s and learned to speak English. John Roebling often told his oldest son that his success would never have been possible in Germany. It was around this time too that John Roebling’s wire rope business outgrew rural Saxonburg; he bought land in Trenton, New Jersey, just then becoming an industrial center, well-situated between Philadelphia and New York. Washington would later note that the land his father bought in Trenton for $100 per acre was worth $22,000 per acre in 1894. 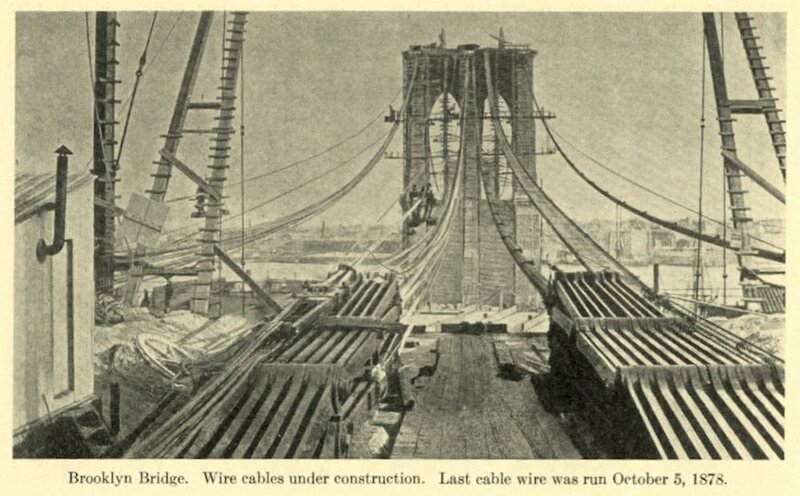 Eventually, wire made by John A. Roebling’s Sons company would be incorporated not only in suspension bridges such as the George Washington and the Golden Gate, but also into the Wright Brothers’ and Charles Lindbergh’s airplanes. The wire also made it into nearly all of Mr. Otis’ elevators. 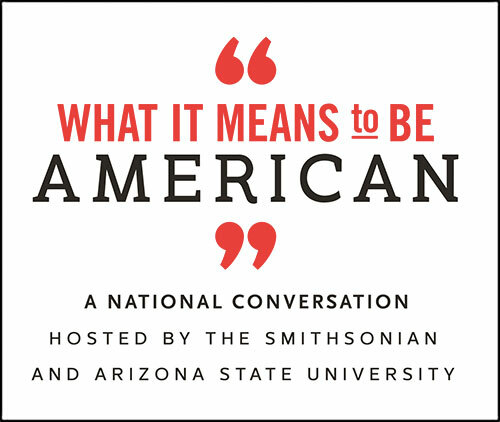 This is the stuff of the American dream—a dream, like those of so many, with immigrant roots. For all his life, Washington worked with men who had come from afar to be Americans; these were the men who built the Brooklyn Bridge. William Kingsley, a wealthy Brooklyn contractor who promoted the project, had been born in Ireland; as had Thomas Kinsella, editor of the Brooklyn Daily Eagle, the newspaper which ardently supported the bridge and Washington Roebling’s work. Wilhelm Hildenbrand, one of Washington’s most loyal and talented assistant engineers, had emigrated from Germany in the years after the Civil War; before his work on the Brooklyn Bridge he had designed the great train shed for New York’s Grand Central Depot (demolished in 1903 to make way for the structure that stands now). And, as Richard Storr had so correctly remarked at the bridge’s opening, the men who worked in the deep foundations of the bridge, who cut the stone and set the great cables in place, who did the most dangerous work on site, came from all over the world. How many men died during the construction of the Brooklyn Bridge? It is hard to settle on an exact figure, since records were not kept in the same way they are now. In the rolls of the dead we can find James McGarrity, born in Ireland, who died in 1871 when a derrick collapsed. William Hines died in the same accident; he was Scottish by birth. Peter Koop, born in Germany, was 20 when he died in 1873; his foot got caught in some machinery. Harry Supple, a rigger renowned for his high-wire feats on the cables, was born in Newfoundland and had been a sailor; he died when a strand of cable snapped in 1878 (as Brooklyn historian Maggie Blanck has written about in detail). Washington Roebling himself was very nearly a casualty. The towers of the bridge were built using “caissons,” chambers of compressed air sunk down into the river’s bed. Men, including the chief engineer, who worked in these chambers were stricken with “caisson disease,” now called decompression sickness, its cause not yet understood. During the worst years of Washington’s illness, his wife, Emily Warren Roebling—whose own family had come to America on the Mayflower—would become the de facto project manager for the bridge, and she is rightly honored with a plaque on one of the great towers. The great East River bridge remains a monument both to the men who lost their lives, and to the engineers who envisioned and built it. It demonstrated that an audacious and beautiful bridge could be constructed in the aftermath of a dreadful civil war, an embodiment of unity and progress in steel and stone. John Roebling often told his oldest son that his success would never have been possible in Germany. John’s newfangled rope enabled the construction of a suspension aqueduct in Pittsburgh in 1844-45, his first big engineering success. Erica Wagner is author of Chief Engineer: Washington Roebling, The Man Who Built the Brooklyn Bridge (Bloomsbury, 2017).